Contractor: Phase 1- Burkhalter Builder, Phase 2- C.L. 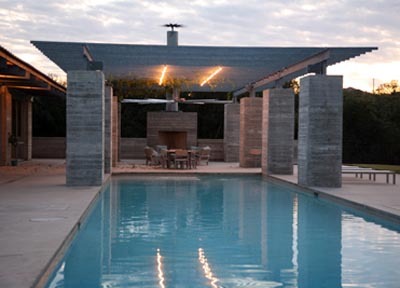 Carson, Inc.
Two parallel hypostyle halls – one covered by a steel trellis, the other enclosed –frame two sisters’ shared family pool house and play area on a semi-rural site. The house sits amongst a small family compound of homes and includes a small kitchen, bath, and a lounge that open to an outdoor fireplace, patio and bocci ball court.